Swingin’ is Believen’ if You Believe in Swing! 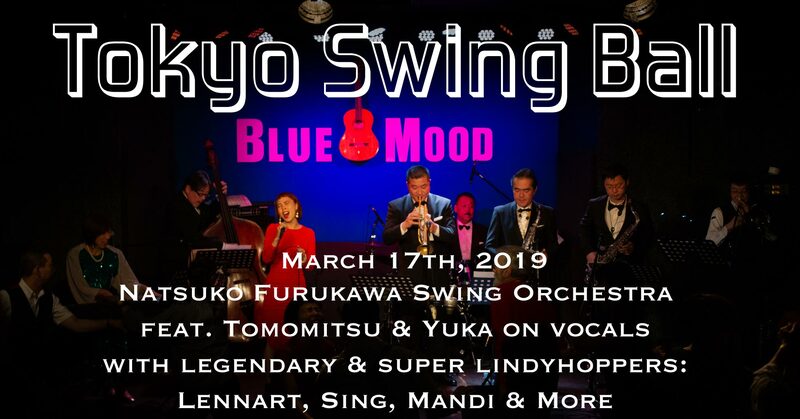 Don’t miss this big swing ball in 2019 presented by Tokyo Swing Dance Society and Swing Cats Tokyo with the #1 swing orchestra in Japan at one of the best venues in Tokyo. The Blue Mood is next Hamarikyu Garden in Tokyo which is a big calm beautiful Japanese-style public garden located near the center of Tokyo. Natsuko Furukawa will lead her swingin’ orchestra featuring two fabulous jazz & blues vocalists. Not only swing dancers, but also jazz listeners will be welcome. Since there will be a free dance lesson before the first set, you can bring your friends too who have never danced before. No reservation is needed and the admission is SUPER reasonable. Let The Swing Time Roll! Tokyo Swing Dance Society has put together a dream team of swing dance leaders for Swingout Tokyo 2019. Lennart Westerlund, Sing Lim, and Mandi Gould have been making major contributions to the international Lindy hop scene for decades. They bring a wealth of talent, experience, and wisdom to the table in all areas from teaching, to performing, to producing events, to the history of swing dance. Not to mention, they are three of the most charming, funny, and lovely people in our dance world. You do NOT want to miss this. You DO want to spend as much time as you can with this delightful trio. And Hiro of the TSDS, along with Yuko Kato of Swing Cats Tokyo, does the most marvelous job of producing absolutely wonderful events. This will be a gathering to cherish forever. Details of the band and guest lindyhoppers can be seen here. No sign-up needed in advance. Please pay in cash at the door. Will be available at the bar inside the venue by cash only. Brown bag food and/or beverages including water are not allowed. The club serves them for you. Thank you very much for your understanding.